ROLLSROLLER Premium is the origin of Flatbed Applicators and a benchmark for this technology. Premium is our best seller, made to meet the needs of high volume industrial production. 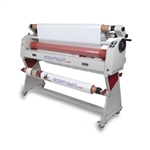 Premium is equipped with side trays for rolls of banner media, which makes it ideal for flex-face sign applications. Located near Houston, TX and available for operational inspection. 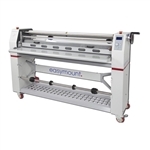 Easymount SH 63" PSA Laminator w/Air Nip Pressure & Heat Assist, NEW!! Canon IPF770 Printer/Colortrac M40 Wide Format Scanner/Copier HP Scitex FB700 98" UV Flatbed Printer w/ Roll Feed Easymount Sign 55" PSA Laminator w/Heat Assist, NEW! !